We were pleased with all the material and help in arranging our ceremony. Our initial meeting was pleasant and relaxed and gave us enough information to start planning and also what documentation was required from us. We found Lorraine Bird to be professional at all times and extremely helpful. We will have no hesitation in recommending Lorraine to friends as we found her to be excellent. 1) The first time we meet you, we had no idea on the process and what it took to organise a wedding ceremony. It could have been a pain in the bum if we had chosen a celebrant who was not on the ball as you were. You gave us plenty of material, hurried us along in the paperwork that was required, but gave us plenty of time with the other stuff. On our end it was so easy. Your material was really broad which is great as it gives you many different angles to choose from. really good. 2) All the meeting we had were well organised on your part. The rehearsal, you didn’t fluff around and got straight to the point. I like that you had the experience to give tips (eg. where to stand… how to walk… how long the signing would take…. etc). All these things are important. 3) I liked your mix between patience and being soft spoken, but getting things done and saying so when something can/should be changed. We got so many comments that day on the ceremony, and how well it went. We were looking for something relaxed, and “George and Chan”, and you made it happen. 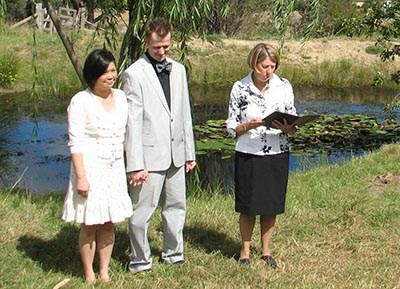 Parnos and I were very happy with the service you provided as our marriage celebrant. You were punctual, organised, knowledgeable as well as supportive and encouraging. In the preparation of our ceremony you were supportive of our wishes and quickly understood what was important to us. You also made helpful suggestions in areas where we had little experience. In the delivery of our ceremony we have been told (we were a little busy at the time) you were a good celebrant because unlike others you did not detract or distract the audience from the commitment that we were making to each other. In our opinion this is one of the greatest compliments that can be made about the delivery of a marriage ceremony. It was such a privilege to have Lorraine to be our celebrant. Due to the long distance, all the pre-wedding communication had to be via emails or phone calls. But Lorraine always took the initiative to contact us and provided plenty of helpful information/material to us. Lots of options and different styles of ceremony were given and she patiently explained each option to us. She also made good suggestions on how the ceremony should be structured and how it should be tailored to fit our wedding. We really appreciate the amount of support Lorraine gave to us, which has saved us tremendous time in preparation. The first meeting and the rehearsal with Lorraine was fun. She gave us clear/detailed instructions on what to do and how to do it properly. Her depth of experience and delightful personality made us feel relaxed and confident. On the day of the wedding, Lorraine did a great job in running the ceremony smoothly. She spoke clearly and sincerely. Our guests were impressed by the quality of ceremony, most of which has to be attributed to Lorraine! Overall, Lorraine has shown her experience and professionalism being a celebrant. We thank her for helping us to have such a wonderful and memorable wedding ceremony. You explained the process very thoroughly and articulately and answered all our questions with aplomb. Your fantastic interpersonal and communication skills put us immediately at ease. Our initial meeting with you filled us with every confidence about the ceremony and what was required and assured us that you were the ‘right’ person for the job. Both the rehearsal and the delivery of the service simply vindicated our initial feelings. When it came to the actual service we knew we were in good hands. The ceremony felt very personal and we received excellent feedback about how “beautiful” it was. First class. Your meticulous preparation left nothing to chance. We were really impressed with the options provided for the ceremony – there were so many! And you were so supportive and kept providing us with new ideas, suggestions and helped us developed our ceremony into something really personal and meaningful. You were also really great about keeping us on track to ensure that everything was done on time. We were really impressed right from the first meeting with you – you were friendly, helpful, frank and had a really nice “vibe” (no better way to describe it I’m sorry!) – the rehearsal was short and sharp and delivered all the information that we needed to prepare for the big day, and the delivery of the ceremony was perfect. Very professional at all times, and also very responsive. Thanks again for everything!!! We had the best day and will definitely recommend you. (1) The quality of options and support given was excellent. We were very impressed by the story you found which was exactly what we needed to make the main event extra memorable, you did not seem phased by anything we threw you or asked you. (2) From the start all your documentation was ready to go and you made it clear from the start about the documents we needed to show you as well as payment that needed to be made. All the choices for the vows etc were clear relatively easy to work through and choose from making the delivery painless and relaxed even with the extra things like the cups and tea ceremony. The rehearsal was fine Just going through what we were going to do so we were all on the same page was a good idea especially to get pronunciations correct. (3) Throughout the professionalism was helpful and supportive and not at anytime did we feel otherwise. We would be happy to recommend you to anyone looking for a Celebrant All the best in the future. We were recommended Lorraine by a friend who had married a year earlier. Lorraine suggested things to consider and gave options of vows. Lorraine dressed in the theme of day, very professional, speaks nicely and didn’t rush. We recommended her to another work friend who married this year. We highly recommend Lorraine. Tony and I thank you for guiding us through the day and making our special moment very memorable. We felt at ease and your calm nature helped us stay focused. Thanks so much for being such a wonderful person. The options you provided us and the feedback provided was excellent. It was particularly great having the 8 different ceremony frameworks provided, as it gave a really good idea of how the ceremonies flow and the options available. The initial meeting was lovely, and it was very nice to talk to you about our lives; it really felt like you were getting to know us as people, not just possible clients, and we didn’t get that from other celebrants we met. The rehearsal and ceremony went really well, I don’t think there were any faults with the ceremony on the day, and it wasn’t raining, which I STILL can’t believe! You were professional throughout and it was great to work with you! Thanks again Lorraine, we had a great day. (1) There were a amazing range of options given which were very useful and your support was fantastic we felt very comfortable discussing our wishes & options with you. (2) These were all also great you made everything feel unstressful and helped us stay calm about things we were nervous about. Your lovely personality also made our light-hearted ceremony all the better. (3) Your professionalism was outstanding as well as very warm and comforting words everything we wanted and needed. Thank you for being so lovely we really appreciate your support. We were very happy with our first meeting, you helped to put us at ease. We appreciated your guidance at our rehearsal and your suggestion of where we should stand was a very good one. You delivered the ceremony with meaning and was clear for us all to hear and understand. Your professionalism is outstanding. We could not have been happier with the way everything turned out and would not hesitate in recommending your services to anyone asking for our assistance. The ceremony was perfect. You were very professional and well spoken. The suit you wore was lovely which tied into our colour themes and you were well prepared. Your PA system was very helpful and did not distort at all during the ceremony. Your response to questions by email was fast and you took the time to make sure we were fully aware of the proceedings and documentation required.